Magimix 17651 Juice attachment and smoothie maker for 3150, 3160, 3200, 3200xl is ideal for most hard and soft fruits and vegetables, take out the internal paddle and this can be used for normal juices like apple juice or carrot juice also the mesh basket is great for sieving soups, simply put your cooked vegetables into feed tube and the attachment sieves the soup or put in the paddle for a higher yield for smoothies, coulis & jams (the paddle pushes the pulp into the side mesh so this produces a thicker Jus from bananas and strawberries) includes heavy duty juice extractor basket, large capacity cylindrical basket for optimum juice extraction, includes funnel for strawberries and other soft fruit,the Magimix smoothie maker kit is also great for making jams, jellies, sorbet and soups. 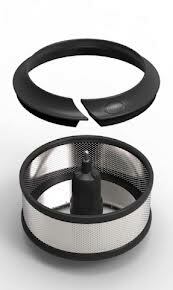 Only for Magimix Food processor models Compact 3200, 3200xl, 3150, 3160 only, Will not fit other models, please check ! Recipe idea : Strawberry Jam - wash and hull 1.5kg of strawberries, process in coulis maker then pour into saucepan and heat. in a separate bowl mix 40g of pectin with two tablespoons of sugar, spinkle this on strawberry coulis and stir with wooden spoon, bring to boil for 3 minutes stirring constantly. Add 1 knob of butter and 1.6kg of sugar bring back to boil for 3 more minutes stirring all the time when 3 minutes are up fill 6-8 sterilized (or taken directly from dishwasher) jam jars to top, seal the jars immediately and tilt backwards and forwards to remove air, then leave to cool. Serve on freshly baked bread.